Tightening the Iron Cage: Concertive Control in Self-Managing Team by James Barker (1993) deals with a type of organisational control which gained more and more recognition amongst theorists of organisational and management theory in recent years - concertive control. Barker’s article attempts to give answers to questions like: What are the consequences when the locus of control within an organisation shifts from the management to the workers themselves? What are the consequences of an increased degree of workforce involvement? And, in which way does bureaucratic and concertive control influence members of an organisation differently? In this context, the author provides the reader with a rather unilateral picture of how concertive control influences members of an organisation. 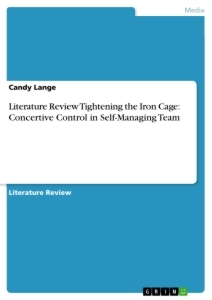 Tightening the Iron Cage: Concertive Control in Self-Managing Team marks the first substantial study in a field where still “very little empirical knowledge” exists “of how self-managing teams construct new and functional forms of control and how these forms compare with how we have conceptualised control in the past” (Barker, 2004). The communication structure of an organisation can be considered as a system of control (Mulgan, 1991). Edwards’ (1981) states three strategies of control: simple control, technological control, and bureaucratic control. Simple control represents a direct form of control through an authorised person, best seen in factories of the last century. Technological control mainly abounds through assembly lines in traditional manufacturing. Bureaucratic control develops from hierarchically based social relations of the organisation (Alsua & Rothenberger, 1998). Tompkins and Cheney (1985) added a fourth category of control to Edwards’ model: concertive control. They described this type of control as less obtrusive and more normative (Gossett, 2006). Barker’s case study of “ISE Communications” shows, drawing on the theory of Tompkins and Cheney (1985), how workers in a self-managing team create a set of shared values to organise their daily work routine. By and by, those values become manifested into norms and rules.